There's a lot that determines your success in an interview - from how you answer questions to the questions you ask, and from the quality of your resume and portfolio to your timeliness and manners. Who will you meet when you interview for a new job? There are a variety of types of job interviews, and who you'll be talking to depends on both the job and the organization. Your interview - especially for a screening interview, a first-round interview, or an interview with a large employer - may be with a human resources manager or recruiter, to assess your qualifications for the job. In this case, it will be a phone, video (e.g., Skype), or in-person one-on-one interview. At smaller companies, your interviewer may be your prospective manager. In some cases, you'll meet with a panel - a group of people who will ask you questions about your qualifications. If the employer holds second interviews, you'll most likely meet with the person you'll be reporting to, and you may also meet with prospective co-workers and/or direct reports. Though it's always important to be polite and professional, establishing a rapport with your interviewer is also key to success. If an interviewer feels an affinity for you as a person, he or she is more likely to feel positive about hiring you as an employee. After all, employers look for recruits who interact effectively with co-workers, clients, and supervisors, and of course, everyone wants to work in a pleasant environment. 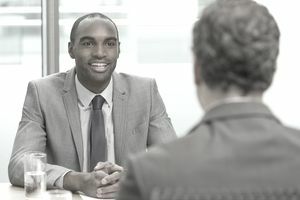 If you fail to connect with your interviewer during the interview, he or she might assume that you may not interact well with other co-workers if you were hired, so it's important to make a good impression. Accordingly, your interview preparation should extend beyond what you will say during your meeting. You should also think about how you'll relate to your interviewer on a personal level. The following suggestions will help you optimize the interpersonal component of your interview performance. Start the interview the right way. Greet your recruiter warmly, as if he or she were a person you were looking forward to meeting. Say something like "So glad to meet you" as you exchange a firm,though not crushing,Here’s how to introduce yourself at a job interview. Be friendly and personable. Smile and exude personal warmth whenever appropriate during your meeting. Be genuine in your interactions and express positive emotions about the position and the company. Interviewers are more likely to view affable candidates favorably, so it's important to be enthusiastic and optimistic. Show your interest in the person as well as the job. Show an interest in your interviewer during the warm-up phase of your interview by asking some questions about them. Making casual small talk before the substantive questioning begins can help to put both you and your interviewer at ease. Questions such as, "How long have you worked here? ", "Have you had other roles at the firm? ", or "How long is your commute?" can help to relax your interviewer and help them warm to you. Make it personal. When appropriate, share some personal information about yourself. Revealing some of your outside interests or background information can help an interviewer relate to you as a person. Remember good posture. Sit up straight and lean slightly forward towards your interviewers to engage them and show that you're interested in what they are saying. Eye contact is important. Make frequent, but not piercing, eye contact with the interviewer to demonstrate that you are listening carefully to what they're saying. Show your interest. Nod and actively show that you are listening by saying things like, "I see," "I understand," "Sounds good," and follow up with questions when appropriate. Pay attention to everyone. In multiple-interviewer situations, make sure you pay equal attention to each person. It is important to establish a positive rapport with all of the interviewers, and not just those with whom you feel a natural chemistry. Here’s how to handle a group interview. Show that you get it. Paraphrase important or complex messages delivered by your interviewer to demonstrate that you understand his/her point. Ask about company culture. Demonstrate your interest in the company culture, whether by asking a follow-up question or initiating the question on your own, so that your interviewer sees you're keen to become part of the team. For example, you might ask, "What's camaraderie like between employees? ", "Do co-workers ever get together outside of the office? ", or "Do you offer any team bonding opportunities or excursions?". Thank your interviewers. Express your sincere gratitude for their time and the insight that they have provided as you complete the interview. Be sure to close the interview on a positive note. Don’t wait to follow up. Follow up immediately with a thank you email or note, or even a phone call, and mention specific reasons why you found the interviewer helpful. Don't forget to also say that you enjoyed meeting with them and hope that you would have the opportunity to work together. If you have met with multiple interviewers, personalize your communications by adding something unique to each email.